It cannot not be disputed that rugby, as winter sporting code in NSW, is struggling behind AFL, NRL and the A-League. Each of these codes have one central controlling body with an integrated marketing strategy. Each code projects a simple clear message i.e. kids come along and play! Their product has been able to tap into primordial tribal instincts of their fans and they have managed to develop resilient club cultures that have been able to survive controversy after controversy. Their marketing strategies start at the grass roots level and work their way up – witnessed by the latest “kids play rugby league” TV campaign. In contrast, under the guidance of John O’Neill, the ARU adopted a top down growth strategy based on expanding the number of Super Rugby teams, thereby increasing the potential for pay TV revenue. Greater Sydney (including Newcastle and Wollongong with a combined population of over five million), is the biggest winter sport market in Australia – with 10 NRL Clubs, two AFL and four A League Teams. The AFL has recently established the GWS Giants and the A-League the unbelievable Wanderers, both in western Sydney. 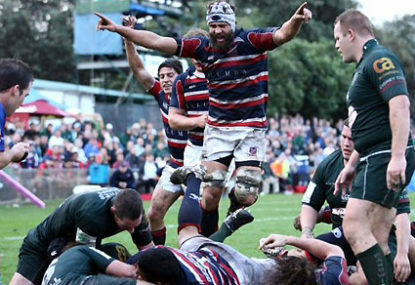 In rugby, the Shute Shield stutters along, while the east Sydney clique recently attempted to dispense with its western Sydney club Parramatta. Further west, Penrith is treated like a country cousin that nobody wants to know. Rugby in NSW has been consigned by all rugby stakeholders to the too-hard-basket. Indeed NSW Rugby management is fragmented and dysfunctional. By modern governance standards it is a cot case. These six separate organisations (with tenuous tentacles into each other) work in six different directions without a centralised goal or marketing/code promotion strategy. Recent marketing has focussed on the stars of the game rather than the game itself. Worryingly, for the first time in rugby, the Brand Beast has appeared – witness the Three Amigos and the level of disrepute they have brought to the game. As an aside, apparently potential sponsorship at the Rebels has been scuttled by the recent behavioural outburst by serial offender Kurtley Beale. What is galling is that the Brand Beast lessons emanating from other codes have not only been ignored but have been emulated. Little wonder the Wallabies do not have a gold sponsor for the upcoming Lions tour. The Wallabies per se are also struggling to attract a season gold sponsor. The combined loss in sponsorship exceeds $10 million. Further, there is concern as to what will become of the Waratahs should HSBC depart. Rugby in Greater Sydney should return to its roots as the Sydney entity (with its proud history), rationalising the (Sydney) Waratahs, the Shute Shield, Junior Development and the two remaining people at NSWRU under the control of one central organisation with a marketing strategy focussed on growing the game from the grass roots. It is only then that it will move from being a house-of-cards waiting to fall to a vibrant organisation with sponsors knocking at its door. A revitalised, centralised, targeted and successful Sydney rugby union will have a positive impact on the flow of revenue directly into the ARU coffers, which directly impacts on funding into the other Australian regions.